Fear is to protect us from harm, not a useless emotional response...Happy New Year to all! The Southern Yellow Billed Hornbill. Upon awakening this morning at a late, 7:30, I bolted out of bed, scanning the bedroom walls and floors for my most dreaded creatures - The poisonous centipede. Sunset over the Crocodile River at our newly discovered overlook. Thanks to Louise and Danie for pointing us this location. Since arriving in Marloth Park, one month ago as of tomorrow, we've seen only a few small centipedes. We have seen many other poisonous insects so far. Sunset over the Crocodile River at we relaxed on the deck of the restaurant at Marloth Park Public Campground. In our minds the centipede doesn't deserve such reverence, although they certainly serve a purpose in nature as does every creature on the face of the earth. Last night, after returning from another delightful braai evening at the home of our new our friends, Kathy and Don, their friends Linda and Ken and cousin Sandy, we moseyed off to bed. By the time, we crawled under the comfy covers it was 11:30. It took me no more than 15 minutes of reading a book on my phone to begin to nod off. At the overlook as elephants roamed the Crocodile River. At around 1:10 am, I awoke to hear Tom moving around the bedroom. Groggy, I asked him what he was doing. He said, "I didn't want you to see this and hoped to take care of it without you waking up." Sitting up in bed, I saw what he meant. There was a giant centipede, the biggest we've ever seen, on the wall near the doorway to the en suite bathroom which he'd discovered when he attempted to quietly go to the bathroom, using his flashlight, hoping not to awaken me. My thoughtful guy. Our first sighting, albeit it at quite a distance, the ring tailed Waterbuck. Instantly, I got that disgusted look on my face. I could feel my mouth turn down into a face only a mother could love - one of sheer disgust. Jumping out of bed, as Tom stood next to the centipede, ready to sweep it into the dustpan with the brush, I said, "Wait, let me get the camera! This centipede on the wall by the bathroom door made us cringe. Tom as always, disposed of it. Sleep didn't come easy the remainder of the night, fearful that the rains of the past few days may have brought more of these inside. I got the shot and seconds later Tom, brave soul that he is, swept it up and tossed it into the toilet, flushing several times. Years ago, i saw an online photo of a snake coming up through a toilet. At that moment, I imagined the centipede coming back up, when we least expected it, while we were on the toilet. Most likely this is a preposterous fear. This ugliness may have been as much one foot, 30 cm, long. But then, fear doesn't always make the most sense. In the past few days, I've been reading a book, entitled, "The Paleo Manifesto, Ancient Wisdom for Lifelong Health" by John Durant, a fascinating read. As we watched the sunset, this Elephant crossed the river. This book quotes scientific studies on both humans and animals in captivity and their horrible physical response resulting to much illness from eating conventional modern day foods, as opposed to what our DNA dictates, that which is readily available in nature in our surroundings. Well, you know I could spend days on this topic but I won't. In the easy-to-read scientific book, he discusses fear which we all experience each day of our lives, fear that is ingrained into our DNA over the estimated 200,000 years that man/woman has been on earth (opinions vary on this length of time). He explains that fear is not a pointless emotional reaction over which we have to "pull ourselves together." Fear is in our DNA to protect us from harm. We fear heights, since we aren't intended to fly and harm could come to us. We fear flying in an airplane, since we're confined with no chance of escape. We fear dangerous creatures, since they have the ability to cause us serious injury or death. Thinking in terms of the caveman, these fears protected him/her and their offspring, protecting the development of the human race. Thus, we don't have to be ashamed of having fear. It's a by-product of being human, deeply ingrained in our DNA. Why are many human less fearful? They've mentally chosen to overcome the natural instincts due to a motivating factor that supersedes the fear. The remainder of us remains fearful in varying degrees. After all, we are different from one another. Observing wildlife surrounding us, we see their fear to protect themselves and to preserve their destiny. As humans, we don't criticize their fear and yet, we mock and criticize our own, often dismissing the seeming pointless fears belonging to others. If we accept that fear at times may be unfounded but that most often it has a basis for our self preservation and the preservation of those we love, perhaps we can become more tolerant of those with fear, embracing their natural instincts. The author pointed out in the book the following, "Why do many people have a visceral fear of snakes, which kill only a few people each year, but not of automobiles, which kills tens of thousands of people each year? Evolutionary theory points out that snakes were a real and deadly threat to our ancestors - but automobiles were not." We don't walk outdoors each morning, looking at the little pink car and feel fearful. And yet we become fearful over the appearance of a centipede. How ironic. Then again, there were no automobiles in the days of the caveman from which our DNA developed. Animals have an innate fear of snakes as do most of us. Animals we've observed in the wild, have many fears; from us, from one another, from being confined or trapped and many from forces beyond their control. With sensible caution, we continue on, fear being our friend, as we strive to embrace our instincts that ultimately provide us with a safe environment. Tomorrow, we'll share the details of last night's braai at our new friend's home on the Crocodile River and tonight's New Year's Eve party at Jabula Lodge where again, we'll gather with more new friends. Mr. Kudu came to call! We've never intended to imply that living in the bush is easy amid all of our nearly constant entertainment from the wildlife and with the people we meet. In many ways it's definitely not for the faint at heart. Giraffe in the neighborhood that we spotted on the way out of the driveway to go to the store. Perhaps living in the mountains of Italy in the summer and then Kenya in their late spring for three months toughened us. I assure you, had we gone directly from Minnesota to either of these locations, we may have turned around and gone back to the US. Notice the Kudu's head tipped up to grab a leaf off the tree near our carport. Perhaps it was our good fortune to have "worked our way" into tougher living conditions that brought us to where we are now, at peace and at home in the bush, but mindful of potential risks facing all visitors to this rough terrain. This is the mineral lick we purchased for visitors that is recommended by the rangers as an excellent adjunct to the visitors natural diet of greenery. So far, the kudus are the only visitors that have tried it. The others sniff and walk away. We'd hoped this would attract wildebeests, yet to spend time in our yard, only running through on one occasion. Below are the adjustments that we have freely become accustomed to in living in Marloth Park that others may find uncomfortable and unbearable. For us and many other tourists, the choice to visit Africa comes with the acceptance of a challenges that one can choose to accept for the joy that Africa can bring in so many ways. 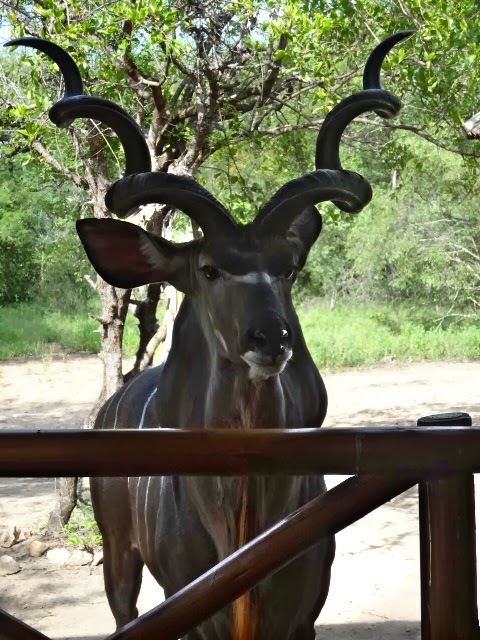 Kudu closeup taken while I stood directly in front of him, behind the veranda railing. 1. Gecko poop - It's everywhere, including in the house. The thatched roof provides easy access for the Geckos to enter. Although harmless, they can be annoying, when last night one ran across the kitchen counter during the preparation of dinner. We see no less than six of them a day inside the house. Outside on the veranda they are everywhere. We don't care. Our warthog friends visit frequently, now so at ease, they've started napping in our yard. In the same manner as beloved pets, even warthogs tuck their chins onto their front "paws" when resting. 2. Heat - It's summer in South Africa. It's not uncommon for the temperature to be as high as 100 F, 37.78C or more and humidity to be in the 80% range. In this house, there is AC in both bedrooms and the upstairs living room/loft. There's no AC in the kitchen or main floor living room. We may spend part of the day outside and come inside to the loft when we need to cool off. The family of nine still stops by almost every day. The other mom and one more baby were off to the side when taking this photo. The babies love looking at us almost as much as the moms. Each time they arrive, we take a head count ensuring all nine are still there. 3. Rain - It's the rainy season now. Since we've been here it's been cloudy five out of seven days a week. For those that require lots of sunshine this may be an issue in the summer. We no longer have a tan or bother to try. The sun when it does shine is so hot it's unbearable to lounge in a lawn chair. This is of little concern to us when neither of us bothered by rain or cloudy days. We do miss the visitors who seem to stay away on rainy days. Upstairs in the loft with AC, in the awful heat a few days ago, we took kudu photos from the second floor veranda as they looked up at us. Kudus can weigh 700 lbs., 317.5 kg or more. 4. Insects - They're everywhere, zillions of them, though not inside the house as much as they were in Kenya. With no screens here, we keep the doors and windows shut constantly and keep our bedroom door closed at all times. With no mosquito nets here (Louise offered but we declined) we've found keeping the door shut helps. It's still necessary to inspect shoes and clothing before dressing to ensure nothing lurks inside. Kudus never seem to miss a photo op. 5. Power outages - Although not as frequent as in Kenya, it does occur for short periods an average of once a week. We've learned to keep all of our equipment charged at all times allowing us to watch movies during a power outage. 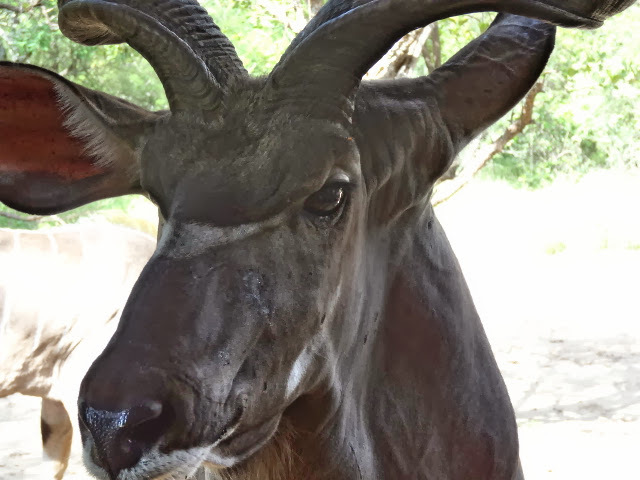 The pink inside their ears, the one line across the bridge of their nose, the white mustache and the white stripes on their bodies, make the kudu a particularly beautiful animal. Females kudus don't have horns, the mustache or the white stripe on the bridge of the nose. 6. Bumpy roads - If a person had a medical issues that made driving on bumpy roads a concern, this environment would not be appropriate. Few roads are paved in Marloth Park. Driving around looking for wildlife is one seriously bouncy experience. We don't give it a thought other than possible damage to the tiny pink car. Had we been willing to spend four times more than we paid, a 4 x 4, would have been a better option. Zebra by the local watering hole. Others were nearby as we observed on our way to the store. 7. Wild animals - The very essence of the joy of Marloth Park is the wildlife over which one must exercise consideration and caution around them. They are wild after all and could carry disease, attack if provoked or in the case of a few snakes and other creatures could inflict life threatening bites and injuries. The closest medical clinic is a 30 minute drive. Had we not experienced the four hour rough and dangerous road in Belize, the hairpin turn roads in Tuscany, the bumpy roads in Kenya, we may have been less tolerant. Had we not been exposed to the endless noisy geckos in Belize, batted off the flies and bees in Tuscany, danced around the centipedes and other insects in Kenya or experienced day long power outages, we'd be less tolerant. But, experience is a powerful teacher and learning and we continue to learn something new and meaningful each and everyday in one manner or another. Each day brings new challenges but with it, comes the exquisite opportunity to embrace life in the bush, so far removed from the life we lived only a short time ago. For this we are eternally grateful. For this, we will never forget. Yesterday morning, after getting comfortably situated on the veranda, coffee in hand, we were stunned as we noticed a new white foam ball on the tree above the pool, a few limbs from the now dissipating former white foam ball, that apparently failed to produce live offspring, much to our disappointment. The following photos are shown in progression as they occurred beginning at 7:58 am, Saturday morning. Look carefully to see the first foam nest on the left, and the new foam nest on the right. Excited to see this again, (click here to see our prior post on December 20th when we discovered the first white foam ball) I grabbed the camera trying to get as close as possible as we positioned ourselves on the edges of the pool. Before our eyes, the foam nest was being made as we watched it grow, totally in awe of this miracle of life. This must have been one of the Tree Frogs that fell off of the small branch supporting the white foam nest into the pool, quickly working his way up the pool and then the tree, seemingly in a hurry to join in on the mating activities. "Give me a minute to catch my breath! I'm on my way!" At the same time, we'd noticed a frog on the edge of the pool, making its way up out of the water, jumping to the tree and quickly climbing to the nest. Within a matter of a few minutes, the nest was covered with Tree Frogs, no less than five males participating! It could have been more than the five but their camouflage like appearance makes it difficult to see. "Hey, you guys, let me get my spot!" "Now we're talking! Foam me up, Scotty!" From what we've read, multiple males participate in the fertilization of the one female after she "manufactures" the white foam nest. The female lays the eggs inside the nest to protect them. At that point, the males climb on and the mating began during which time we made these videos as we've shown here today. An hour later, they started climbing off the foam nest which appeared to have been well fertilized! With the mating process of the African Tree Frog lasting only a matter of minutes, it is indeed miraculous that we happened to be outside at precisely the correct time to witness the entire event from the veranda. Good grief. May I say this yet another time? "Safari luck" once again kicked in. Will this batch of tadpoles survive? We don't know. Most likely they won't, with the chlorine in the pool plus the use of the pool filter, which we can't turn off for the week it will take for them to mature. The pool could turn to green slime in a week's time. After all, this isn't "our" house. So, we'll wait and see what transpires once again and of course, report any results here. And, if we get lucky and mama tree frog gets lucky, her babies will survive, and her two attempts will not have been in vain. Ah, nature, what a treasure! Keep it comin'! Check out our elephant videos. Yesterday morning, Danie stopped by to give us a list or more fabulous things to see in this astounding area. As if we haven't been busy enough! We've had more activity in the four weeks in Marloth Park than we've had combined everywhere else we've visited so far. The three elephants began their walk closer to where we were standing at the railing and the fence at the Marloth Park township public park where the viewing of the Crocodile River was stupendous. Keeping in mind that if we just stay home, the action often comes to us as it has this morning and it's only 8:30 am as I write this. We'll share that story tomorrow with some exciting photos and another of my shaky videos. (Bear with me folks. I'll get better at this. That darned shoulder of mine makes it hard to hold the camera steady). Within a short period they were in front of our lookout spot and we could easily enjoy their munching on the vegetation, often putting whole bushes into their mouths. elephants, herbivores, eat 100 to 200 kg, 220 to 440 pounds of vegetation per day. I know some may say, "Get a tripod!" I agree a tripod would be a nice tool but we're already at the edge of the luggage being overweight and plus, the action here happens so quickly there's no time to set it up, or manage a tripod when the action here requires much moving around to get good photos. After careful observation, we noticed that the leader of the herd was a female (cow) and the other two (clearly visible) were males (bull), one being younger, maybe her offspring. What transpired yesterday is that which we're sharing today, another wondrous event. This was the female leader. Normally, the dad doesn't stay with the herd, instead gathering into a herd with other males. We assumed the smaller male was her offspring based on the way she kept an eye on him from time to time. We were uncertain as to the role of the larger male but we were certain there that they were two males. When they entered the water we were undoubtedly able to ascertain that they were both males, as their male organs were clearly visible sloshing in the water. Back to Danie. During his visit he told us of a nearby campground that has an amazing lookout point, closer to the Crocodile River than the lookout we've visited twice in these past weeks. Thirsty after consuming a considerable amount of food, the baby wandered to the shore for a drink. This is shown in the included videos. Shortly after he left, we jumped in the little pink car with an empty water bottle to refill at Credence Clearwater, a mile away on the paved road. After having the 20 liter bottle refilled at the cost of ZAR $18, US $1.76, we decided to check out the campground. Without drinking, suddenly the mom, the largest of the three elephants, entered the water, walking past the baby and began walking to a nearby island. Marloth Park is not huge. It's only 3000 hectares, 11.58 square miles. We had no trouble finding the township owned campground, Tom having remembered seeing it on one of our many driving expeditions around the area. Taking this photo without zoom gives a perspective of the small size this island, somehow appealing to her for its varied vegetation. In a matter of six minutes we entered the security gates of the public park, were stopped and asked why we were there, after explaining "to see the overlook," we freely pulled inside to a veritable wonderland of meticulous grounds. As soon as the two males noticed the female had moved over to the tiny island, they took off following her. At this point, we speculated that this larger male was perhaps an older offspring, yet to leave the safety of his mother. With the holiday season, the park (within a park) was filled with tourists. Many languished by the huge, clean swimming pool while others gathered at the outdoor pub with pool tables, bar stools and a casual burger and chips (fries) fast food type restaurant. Others played games with their children or had picnics at the many picnic tables. When a group of tourists blocked my view, I was unable to get the photo of the mom leaving ahead of the males. We were excited to see that we could order an entire grilled chicken with chips to-go if we'd like, for ZAR $70, US $6.86. Taking it home, Tom could eat the chips while we would add coleslaw and veggies for an easy dinner suitable for both of us. Most likely, we'll return for this purpose on a night we don't want to dine out or cook dinner which happens fro time to time. After checking out the facilities, amid maneuvering past tourists soon to depart after the holidays, we made our way to the most appealing aspect of the park, the close-to-the-river overlook. Please check out this second video. We excitedly stepped up to the wood railing and the wire fence, intended to keep tourists from falling into the crocodile infested river and to keep the lions in Kruger Park from entering into Marloth Park (not always possible) which is on the opposite side of the Crocodile River. Of course, we were hoping to see some action on the river. Within a few minutes, our "safari luck" kicked in and the action began as depicted in today's videos and photos. How did we get so lucky? One can wait for hours at an overlook only to see a distant elephant, an occasional hippo head bobbing in the water, a slithering croc or a cape buffalo along the Kruger Park side of the river. It was on December 11th that we posted photos of an elephant ritual on the Crocodile River, seen from quite a distance in this post. Yesterday, we were up close and personal, a huge advantage for another glorious experience. These three videos say it all. Once again, we couldn't stop smiling, having witnessed the behavior of these magnificent animals, the largest to roam the earth. We'll be back tomorrow with more, more and more. Gee...will we ever have a dull day in Marloth Park? We hope not. But if we do, we can always go back to playing Gin. giraffe made it clear that she had the right of way. We've found that every three months or so, it's necessary to place an order for supplies. As we've mentioned in the past, the shipping costs are outrageous, particularly if we need the package to arrive quickly. After one of our surge protectors were confiscated from our carry on at the Dubai airport and an electrical converter and another power strip burned out in Kenya from the generator, we were operating our digital equipment with minimal supplies. Appropriate replacements for these were nowhere to be found in Kenya nor in South Africa. "Yum, these taste better on this side of the road," she says. After the annoyance of swapping the plug in for our laptops every few hours, we decided it was time to place an order which we did as usual through Amazon. Plus, I needed a pair of Keds leather slip-ons. The pair I'd been wearing (one of only a few pairs of shoes that I own) were worn beyond one more wearing. 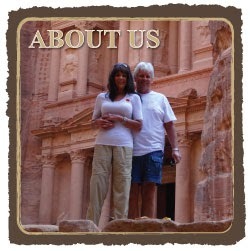 Most items are shipped free to our Nevada, USA mailing service. When all of the items arrive, they remove the packing materials and ship it all in one box. The treetop munching was still pretty good on this side of the road for these two. This time, we chose to send it through the US Postal Service sending it the slowest and least costly way, which hopefully would arrive in six weeks or less. Earlier than expected, Louise walked in the door with our box of supplies on Tom's birthday, December 23rd, handing us a slip of paper saying we owed ZAR $279, US $26.97 to the local post office for customs fees. Immediately, we knew the cause of the extra fees...the pair of shoes. While in Kenya, placing the order a few days before we'd left, I'd read that South Africa doesn't allow pairs of shoes to be shipped, only one shoe per box. bill. They were living near a dumpster situated behind the little strip mall. Thus, when customs opened the box and saw the pair of shoes, they'd decided to let them go through but would charge the fee. But, I have my shoes, never having been so happy with a new pair of shoes, extra fees and all. Having hooked up our two new power strips, we no longer have to swap back and forth, making life a little easier, not that life in Marloth Park is tough. Skittish around people, they aren't shy around food, constantly on the lookout for scraps. Sure, there are many insects, some scary, the heat can be unbearable at times (with comfortable days in between), most of the roads are unpaved and bumpy, but who's complaining? Had this been a holiday/vacation for a mere week or two this by far would have been the most glorious holiday/vacation of our lives. Knowing we have over two more months in Marloth Park, enjoying its many wonders makes our hearts leap with joy. Flowers aren't prolific in Marloth Park. The few that grow are stunning. Tonight, we'll dine in, the second night in a row, savoring a giant piece of trimmed beef tenderloin that we cut into ample sized fillets, enough to last both nights with sauteed Portobella mushrooms, two side vegetables, and a bowl of our daily staple, coleslaw. Today, a cooler day than yesterday's scorcher, we'll lounge on the veranda awaiting visitors and later take a sunset drive to search for more. This photo was taken a few days ago with the sun in my eyes. It wasn't until I downloaded it to my computer that I realized that the two birds were on the impala's back. Check out the babies sitting in the grass near their mom. Tonight, we'll watch the second half of the recent movie, "The Butler." Gee...I could do this forever. Life is good. Not wanting to alarm this visiting kudu when we left the house to get into the car to go out to Christmas dinner, we interpreted this as a Reindeer visitor. Practically, holding our breath, we took this photo with the carport support post in the way in the hopes of not scaring him off. With no Christmas tree, no decorations, no gifts to unwrap, no big dinner to cook and no friends and family stopping by, it was a different kind of Christmas for us, living in the bush in South Africa. The temperature in the steamy low 90's F, 33's C, it hardly felt like the Christmases we once knew and loved. We're not complaining. It was different. The kudu's neck will enlarge during the mating season. From the looks of our visitor, mating season must be imminent. Look at the muscles on this big guy, males can weigh as much or more than 700 pounds, 318 kg. This one was smaller than many we've seen weighingperhaps in the 500 pounds, 227 kg range. Kudus can easily scale a 5 foot, 1.5 meter wall. And, different can be good, if one can find alternate means of enjoying the holiday season. Fortunately, thrown into our laps were two situations that proved to make both Christmas Eve and Christmas day special in a manner we never imagined. Call it "serendipitous" if you will, or merely our good fortune. By Monday morning, we had no plans other than attending a midday buffet at Jabula Lodge, which was fine with us. By Monday afternoon, it all began to change. View from Kathy and Don's third floor veranda, overlooking the Crocodile River. Little did we know, we'd be invited for Christmas Eve to the home of Kathy and Don, people we'd never met, long time homeowners in Marloth Park, who's gorgeous home overlooks the scenic Crocodile River for a fabulous evening of laughter and story telling of mutual world travels and more. Little did we know, that as we walked out the door at noon to drive to Jabula Lodge for Christmas dinner, that a giant kudu would be standing at the edge of our carport staring at us, reminding us of a reindeer, it's massive antlers swirling high into the air. Kathy suggested we start putting food out for the bush babies whom we've yet to see in our yard at night. We've feared doing so may attract the destructive baboons, who love hanging out on our veranda when we're not home. Stopping dead in our tracks, I slowly reached into my handbag to grab the camera. I was so excited, I could barely take a good photo. Nonetheless, albeit less than ideal with the pole in the middle of the shot, we got a few. For 15 minutes, we watched him as he lumbered about our yard, nibbling on the lush vegetation, finally taking off into the deep bush and no longer visible. As we drove off Tom claimed, "Oh, I arranged that for your Christmas gift." I chuckled, saying, "There's no gift that I'd have enjoyed more." Little did we know, a short time later when we arrived for the buffet at Jabula Lodge that we'd be seated with yet another fabulous couple, Piet and Hettie, also Marloth Park homeowners, with whom we spent the better part of the day enjoying fabulous conversation. Later, we hugged goodbye, with hopes to getting together again before they leave depart for their second home, a three hour drive from Marloth Park. We'll never tire of the adorable face of a giraffe with it's cheeks stuffed with greenery, this one captured in our neighborhood. As we returned home, we couldn't wipe the smiles off of our faces. In awe, not only in the wildlife visitors in Marloth Park, but also in the realization that people in Marloth Park are unlike any we've met anywhere, friendly and open to making new friends. After returning home, we watched a movie from Graboid, "Captain Phillips, a story about pirates boarding and taking over a cargo/container ship out to sea in the Gulf of Aden. It was in this exact location that we'd sailed on May 17, 2013 with the necessity of sharp shooters boarding our ship with automatic weapons to secure our sailing through the Gulf of Aden, as told in our story at this link. Watching this movie brought it all back for us, an adventure we'll never forget. Little did we know, that traveling the world would present situations, people, culture, wildlife and nature to us in a manner we could never have anticipated. For us, this has been the gift that "keeps giving" for which we are eternally grateful and for which, we promise ourselves, that we'll never stop appreciating. Little did we know. Not quite a reindeer! 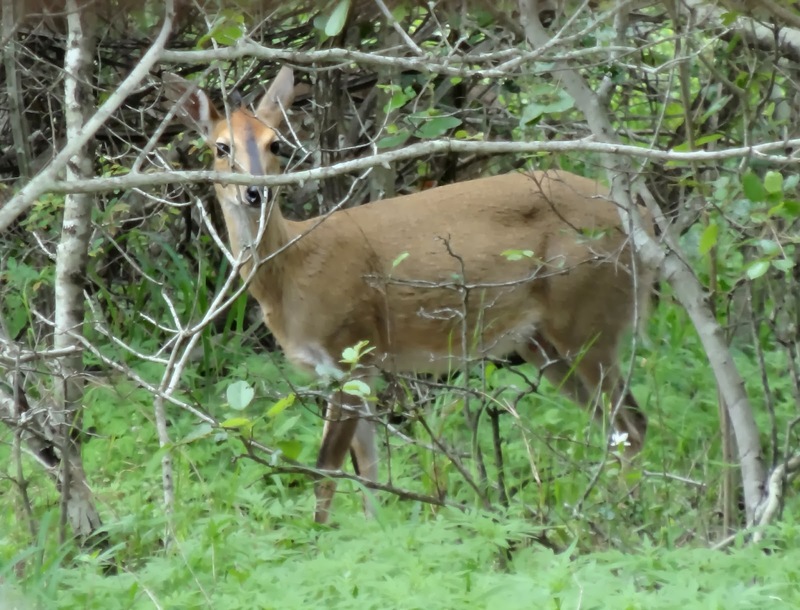 This duiker tentatively looked at us through the bush. They are "very shy, elusive creatures with a fondness of dense covers" most often traveling alone. Merry Christmas to all of our readers, the actual day of our 500th post! It's hard for us to believe that it was in March 15, 2012 when we wrote our first post. Here's the link to that first entry which seems so very long ago. Much has changed for us; our circumstances, our priorities, our resilience and our tolerance for discomfort. We've learned more during this period of time than either of us had learned since our school days. We've taken risks that we'd never imagined possible. We witnessed events we'd never imagined we would see. We've learned to remain calm when in the past, we'd have run around in circles, frantic and unfocused. We've learned the value of patience, the avoidance of preconceived notions, and the ability to be more tolerant of others. We've learned to communicate when we don't understand the language, knowing that kindness goes a long way in any language. A lone gon a walk along a road in Kruger Park. Our guide, waited patiently for him while he took his time moving out of the way of our vehicle. We've learned to "go without," to make use of what we have on hand and oddly, we've learned to become minimalists, reveling in "less is more." Letting go of the need for "stuff" has reshaped our lives. We've found ways to entertain ourselves without TV, although we both thrive on keeping our brains active with some favorite interesting shows as well as the profound absorption of science, geology, history, biology and more as we research any morsel that peaks our interest. Yet, through all of this time, since the first day that we wrote here, we've been humbled by how much more we have yet to learn, to experience and to explore. In the process, we've accepted that we have some limitations due to our age and condition and the fact that there are certain creature comforts we're not willing to forgo, such as sleeping in a bed, being able to shower each day, eating and drinking safe and healthful food and water. We've never been interested in staying in hostels, sleeping in ordinary tents, carrying backpacks and trekking through mountainous terrain. We don't do zip lines, bungee jump or white water rafting or take unnecessary risks that could potentially put an end to our travels. We continually strive to protect our health, our well being and our emotional strength and resiliency. And above all, we treat our relationship with one another with great respect, consideration, kindness and love. Without that, we couldn't go on. We continue to write and post photos almost every day. In the beginning, we wrote every few days. Since leaving the US, we've posted almost every day with no plans to change that in the near future. Although few of our readers have officially "joined" our site to receive automatic email each time we post, our readership is now in the 130,000 range with this month of December being our highest readership ever. Most of our readers prefer to click the link or their bookmarks to find us each day at their leisure. We thank each and every one of you for sharing this journey with us. As we approach the New Year, we hope you'll continue to read our posts as more and more diverse experiences unroll in our path. 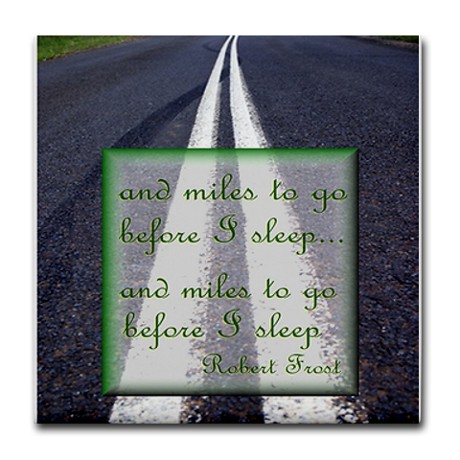 No words of mine can better express our intentions than those of poet Robert Frost in his poem, "Stopping by Woods on a Snowy Evening" and in his words, "and miles to go before I sleep."